The Leave and the Remain campaigns are united in dismissing the Norwegian solution. The Brexiters want to control immigration, which is incompatible with it, and the pro-EU side rightly argues that it’s a very much inferior solution compared with full membership, because it would require the UK to follow all the rules and pay a lot of money without having any influence. However, nobody wanted the Norwegian solution in Norway, either, and yet that’s what they ended up with. That’s because that’s what you get when a majority of the population says No the EU while a majority of MPs say Yes. 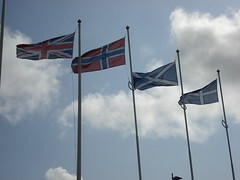 Without a referendum, Norway would simply have joined the EEC together with the UK, Ireland and Denmark back in 1973, and if not then, then together with Sweden and Finland in 1995. Forced to remain outside the EEC, the politicians opted for the second-best solution instead. Something similar might happen after a Brexit vote: Pro-EU MPs have a huge majority at Westminster (everybody from the SNP and the Liberal Democrats, almost all Labour MPs, and at least a quarter of the Tories). This means that any attempt to cut the ties to the EU completely will be voted down, and the most likely outcome is some sort of Norwegian (or perhaps Swiss) solution. The Leavers might complain that people didn’t vote for that, but the Remainers will simply say that the voters were promised the UK would retain full access to the Internal Market, and this is the only way to achieve it. If the Brexit referendum had taken place a decade ago, I’m almost certain the UK would have been offered a Norwegian solution, perhaps even with some nice little opt-outs. However, in the current climate I fear many of the other EU countries will want to be tough on the UK. This is not primarily due to anger or a need for revenge, but because they’re afraid of the own Eurosceptics. In particular, the French establishment will want to frighten their voters away from voting for the Front National in next year’s presidential elections — and indeed this party is very keen to follow the UK out of the EU. It’s still possible the UK will be offered a Norwegian solution, but it will probably be on a basis of take-it-or-leave-it, without any opt-outs. It’s even possible the UK will be forced to join parts of the EU that the British government has so far managed to stay out of, such as Schengen. The Leavers won’t be very happy if this is the eventual outcome, but I reckon a majority of MPs would sign up to it if they realise it’s the only way to retain full access to the Internal Market. It’s almost certain none of the wild dreams of the Leave campaigners will be realised because they don’t have a parliamentary majority. So if we’re lucky, a Leave vote will lead to very few changes (but a great loss of influence), and if we’re unlucky, it’ll lead to the UK being excluded from the Internal Market. It’s really a lose/lose situation, so please vote Remain!